Conditions such as Golfer’s Elbow and Tennis Elbow are very common amongst athletes in all types of sports. Along with golfers and tennis players, swimmers, rowers and volleyball players are also prone to Elbow Tendonitis. That’s why you see so many of them with their elbows taped up. 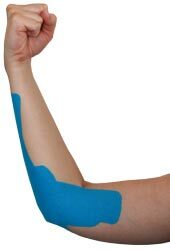 Taping the elbow can help prevent strain and re-injury during physical activity. Also at risk are people who use their elbow and forearm repetitively at work, such as painters and carpenters. 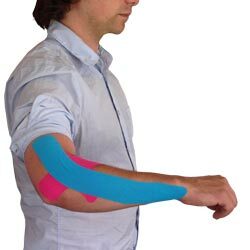 If your line of work has caused a repetitive strain injury in your elbow, you may want to consider wearing tape while you work. This will help to protect and support your fragile tissue and prevent further aggravation. Taping also provides light compression to relieve your swelling throughout the day. Take one full length piece of tape (about 10 inches) and cut it in half, rounding the corners, so you have two pieces that are each about 5 inches in length. Bend your elbow to 90° and apply the 5 inch piece vertically over the point of pain on the outside of your elbow (the exact point of pain will differ from person to person) with 80% stretch in the middle and no stretch at the ends. Next, take the other 5 inch piece of tape and tear the backing in the middle, peeling it away so you are holding onto the two anchor ends. Apply the second 5 inch strip horizontally over your point of pain with 80% strecth in the middle and no stretch at the ends, forming a "cross" shape with the first piece you applied. Take another full length piece of tape and, removing the backing, anchor one end directly above where the previous piece was anchored, using no stretch. With your wrist flexed, pull the tape down over your point of pain and angle it along your elbow and down your forearm, using 25% stretch. Lay down the other end with no stretch and rub the tape in to ensure sticking. Bend your elbow to 90°. Tear off the backing on the un-cut end of the tape and anchor it over the bony bump (medial epicondyle) on the outside of your elbow with no stretch, so the two "Y" arms are pointing down towards your forearm. Peel the backing off the upper "Y" arm and apply it down the length of your forearm to your wrist, using no stretch. Peel the backing off the lower "Y" arm and apply it down the length of your forearm to your wrist, using no stretch. Take another full length piece of tape and cut it in half, rounding the corners, so you have two pieces that are each about 5 inches in length. Apply the strip horizontally over your point of pain using 50% stretch in the middle and no stretch at the ends. Hold your arm up in a 90° position and apply the 5 inch piece vertically over the point of pain on the inside of your elbow (the exact point of pain will differ from person to person) with 80% stretch in the middle and no stretch at the ends. Take another full length piece of tape and tear the backing off one end, anchoring it directly above where the very first piece of tape was anchored, using no stretch. Pull the tape down over your point of pain and angle it up along your the inside of your elbow and forearm, using 25% stretch. Lay down the end of the tape with no stretch and rub the tape in to ensure sticking. Take one full length piece of tape (about 10 inches) and cut it two thirds of the way down the center to make a "Y" shape. Tear the backing off the un-cut end and anchor the tape just above the bony bump on the inside of your elbow with no stretch. Peel the backing off the two arms of the tape and lay them down over your forearm muscles with no stretch. Take another full length piece of tape and cut it two thirds of the way down the center to make a "Y" shape. Tear the backing off one end and anchor the tape just above the point of pain on the inside of your elbow with no stretch. Peel the backing off the two arms and, using 50% stretch, angle them towards the outside of your elbow, ensuring they don't touch. Lay down the ends of the tape with no stretch and rub the tape in to ensure sticking.